The name of one of the three great orders or gilds of Temple singers, in charge of the music of the Temple from David's day down into post-exilic times. In I Chron. xvi. 41, 42 Jeduthun is mentioned along with Heman as one of the musicians in service before the Ark of the Covenant; and also as the father of a class of doorkeepers (ib. xvi. 38, 42). In I Chron. xxv. 1, 6, and II Chron. v. 12 Jeduthun, Asaph, and Heman are mentioned as the three heads of the musical part of the Temple service. In II Chron. xxxv. 15 Jeduthun is called "the king's seer." In Neh. xi. 17 is mentioned the descendant of a Jeduthun engaged in service with the Levites. In I Chron. vi. 33, 39, 44, and xv. 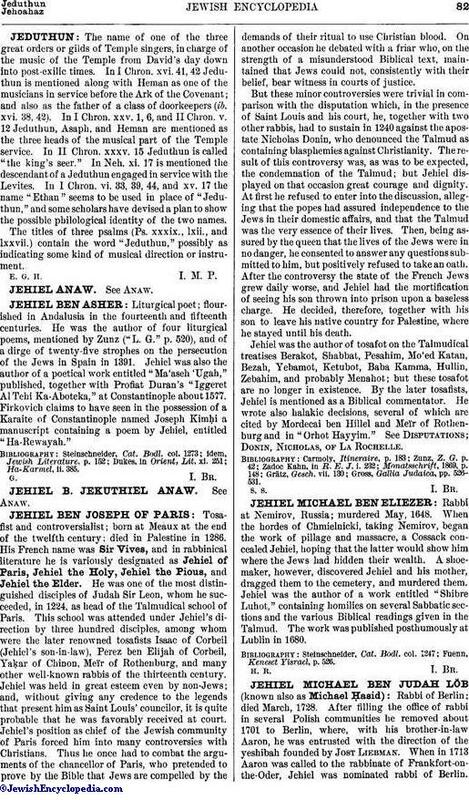 17 the name "Ethan" seems to be used in place of "Jeduthun," and some scholars have devised a plan to show the possible philological identity of the two names. The titles of three psalms (Ps. xxxix., lxii., and lxxvii.) contain the word "Jeduthun," possibly as indicating some kind of musical direction or instrument.